Singer/songwriter Jimmy LaFave's career dates back to the late-seventies when he released his first solo albums just after graduating high school. His music has been described as "Red Dirt Music" as he was a follower of fellow Oklahoma native Woody Guthrie's recordings. Jimmy LaFave will be releasing his 18th studio album "The Night Tribe" on May 12th through Music Roads Records. The sound on his latest release seems influenced from his production of the Jackson Browne tribute album that he worked on just last year. The new 13-song release begins with the smooth groove of "The Beauty Of You" as you are introduced to LaFave's amazing songwriting. The song "Maybe" has a Jackson Browne influence playing through this mild rocker, while his mellow, acoustic cover of Neil Young's "Journey Through The Past" puts your mind at ease. Jimmy LaFave picks the tempo back up with the bluesy-rocker "Trying To Get Back To You," before slowing the tempo down once again for the gospel-like feel of Bob Dylan's "Queen Jane Approximately." The steady rhythm of "Never Came Back To Memphis" and "Dust Bowl Okies" has the band showcasing their skills as Jimmy's words lead the way. Jimmy LaFave & The Night Tribe have a load of dates that run all summer long. 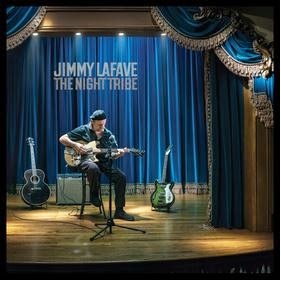 To find out more about his latest album "The Night Tribe" and about his live shows, please visit jimmylafave.com.